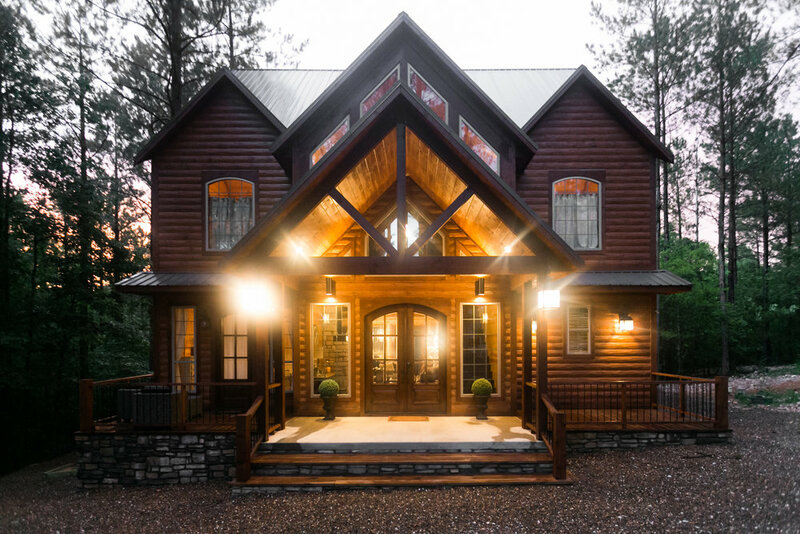 Be pampered in luxury and comfort while enjoying nature and all the great outdoor activities that Beaver’s Bend State Park and Broken Bow Lake have to offer at the brand new Lightning Bug Lodge! This modern farmhouse-inspired cabin sleeps 14 with 2,700 sq ft of living space indoors and over 1,000 sq ft of outdoor living space. The outdoor balconies and decks feature an outdoor fireplace and large hot tub cabana. This spacious lodge sits on a one- acre lot that backs up to a seasonal creek down the hill in back. Located in the popular Timber Creek Trails South area, Lightning Bug Lodge is close to the Carson Creek entrance of Beavers Bend State Park and the heart of all that Hochatown has to offer in terms of shops, dining, and entertainment opportunities. This cabin’s living room has soaring cathedral ceilings, a wall of windows, a beautiful stone fireplace and a 65” LG TV. The open floor plan also features a spacious kitchen and dining area. The well equipped kitchen has a massive 9’ island, quartz counter tops, two ovens, and high- end stainless steel appliances, making it a joy to cook for family and friends! There are two king bedrooms on the first floor, each with its own double vanity en suite bathroom. The elegant master bedroom has a fireplace, a door opening to an outdoor sitting area, and a luxurious bathroom complete with a large shower and sleek soaking tub. The rustic second master bedroom downstairs has a door that opens to the outdoor fireplace, lounging chairs, and a 6-person hot tub gazebo. The back covered patio off the kitchen/dining area has an outdoor living area with a double-sided fireplace which can be seen from the hot tub gazebo. It also has an open deck dining area with a grill for those summer cookouts and beautiful evening al fresco dinners. A third full bath with a tiled shower completes the first floor. Upstairs, you will find a spacious loft overlooking the downstairs living room with an amazing custom built queen over queen bunk bed with built in reading lights, privacy curtains, and steps instead of a ladder, making it very adult friendly. The loft also has an entertainment wall unit with a 55” TV, a foosball table, and a card/game table with four chairs for evening fun and entertainment. The loft also features double doors that open to a covered upper deck with a swing bed for those who want the experience of sleeping outside among the trees and under the stars. Upstairs also has two bedrooms, each with a queen canopy bed and twin day bed, sleeping 3 per room. Each queen bedroom also has its own en suite bathroom with double sinks, and two showerhead sports showers. 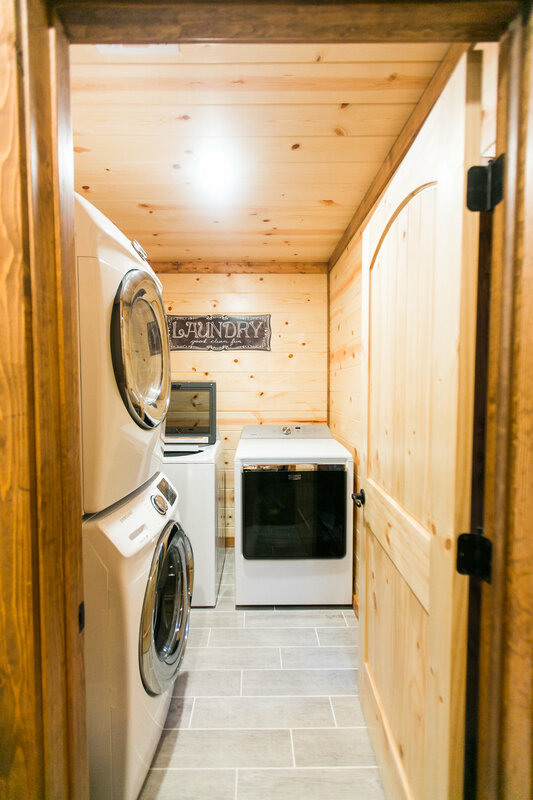 The upstairs laundry room has two sets of washers and dryers if you feel a strong need to do laundry while on vacation. All the bedrooms have ceiling fans and come equipped with 50” Samsung TVs. Come stay at the Lightning Bug Lodge in Broken Bow and enjoy a slower pace of life filled with childhood wonder, explore Beaver’s Bend and its natural beauty, and make wonderful lasting memories! Bedrooms: 4 Bedrooms + loft.